Both Overdraft and Cash Credit are widely used short-term finance provided by Banks or, other financial institutions to their customers to fulfil their short-term working capital requirements. 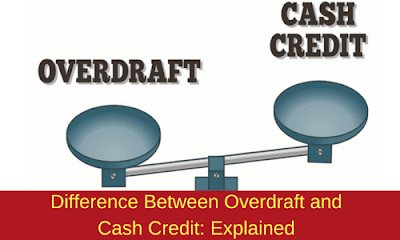 Both Overdraft and Cash Credit are having some similarities like payable on demand, more money can be withdrawn that that available in the account, there is a limit on withdrawal if we are withdrawing more than that available in our account, both charges interest on extra withdrawal. Both these facilities are very similar in nature, but we need to understand their differences in order to understand them in a better way. It is a facility provided by the banks to their customers to withdraw more money from their accounts than that available in their accounts. The overdraft facility is usually available to the current account customers and in exceptional cases to the savings account holders also. The extra withdrawal is decided by banks or, the financial institutions and they may vary from bank to bank. Interest is charged on the overdraft amount i.e. the extra amount that is withdrawn above the deposit. These are repayable on demand i.e. the bank can call the customer to repay the amount at short notice. Cheque book facility is available for the account holders. It is a facility provided by banks or financial institutions for short-term lending that is required to any company or organisation to fulfil their credit need. This credit amount is provided up to a predefined limit. This facility is provided for the business purpose only if the customers have submitted the company assets, inventory, company papers etc. to the financial institution. The limit of cash credit is generally supposed to be equal to the working capital requirement of the company. The withdrawal limit is decided by the bank and varies from bank to bank. Interest is charged on the extra withdrawal. Cheque book facility is provided. An overdraft facility can be availed for any purpose (that means for personal use as well as for business purpose also). Cash Credit is specifically given for the purpose of business or, business related activities. The excess withdrawal facility is provided to the current account holders and in exceptional cases to the saving account holders. The excess withdrawal facility is given only if a customer opens a Cash Credit account with a bank. Overdraft is provided for a shorter duration of time (generally one week to one month). They can be short terms and medium terms also (generally up to 1 year). The Overdraft amount limit i.e. the excess withdrawal limit remains constant. The excess withdrawal limit keeps varying as per the current assets kept as security. The rate of interest is higher than that of interest charged on Cash credit. Rate of interest is low w.r.t. Overdraft. Cash Credit and Overdrafts are two very important tools to fulfil the short term capital requirement of any individual or, company. Both are very similar in many aspects but we can see there are some differences also between them.